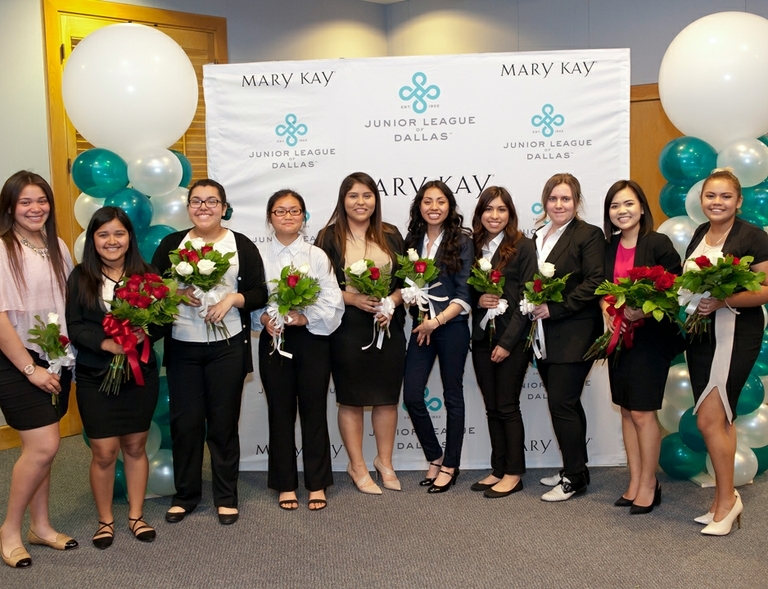 DALLAS – MARCH 23, 2018– The Junior League of Dallas (JLD), presenting sponsor Mary Kay Inc., and Dr Pepper Snapple Group, are pleased to announce that they held the fifth annual Women LEAD (Learn · Excel · Achieve · Dream) Scholarship Program Awards, granting $40,000 in scholarship funding to 10 college-bound women. The annual program aids female high school students in pursuing their dreams of higher education and creates opportunities for future women leaders. Competitors had a chance at the grand prize – a $15,000 college scholarship – or a second place $10,000 scholarship, a third place $5,000 scholarship, a fourth place $4,000 scholarship or one of six $1,000 scholarships for fifth through tenth place winners. From the applications received, 10 finalists were selected to compete in a speech competition and awards ceremony, which was held Thursday, March 22, 2018, at the Junior League of Dallas Headquarters. 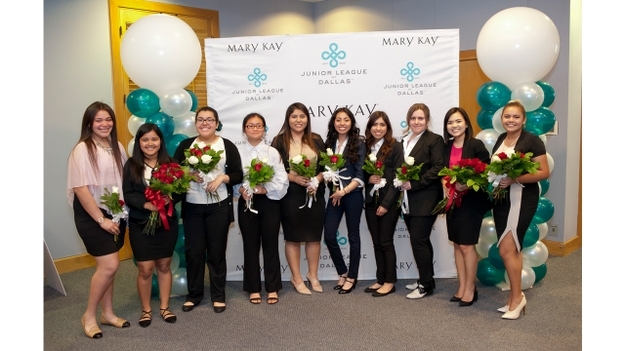 Established in 2013 in collaboration with Mary Kay Inc. and inspired by its founder Mary Kay Ash, the Women LEAD (Learn · Excel · Achieve · Dream) Scholarship Program awarded $25,000 in funding each year to four deserving college-bound women. With the generous support of Dr Pepper Snapple Group, in 2017 funds increased by $15,000 making it possible to award four deserving college-bound women with a sum of $40,000 in scholarships. Now, the Women LEAD program reflects how deserving each of these finalists truly are and has been restructured so that all 10 finalists will be awarded a scholarship. Applicants must possess a 3.0 GPA at the end of their junior year, plan to attend a two- or four-year college or university and have a record of service to both their school and community. At the prior year’s event, Alejandra Landa from Thomas Jefferson High School was named the 2017 First Place winner. Landa gave an inspiring speech on finding balance between school and her enormous responsibility of helping to care for her family at home. She is now attending a Dallas County Community College with the goal of transferring to The University of North Texas to pursue a Bachelor of Science in Biology. The 2018 program included three Dallas high schools – Emmett J. Conrad High School, Thomas Jefferson High School and South Oak Cliff High School. Judges of the 2018 program included: Jennifer Tobin, Junior League of Dallas President, Julia A. Simon, Mary Kay Inc. Chief Legal Officer, Judge Amber Givens-Davis, 282nd Judicial District Court Judge and Nisha Shah, Dr Pepper Snapple Group Associate Brand Manager. WFAA Anchor, Kara Sewell served as the emcee. To learn more, please visit jld.net. The Junior League of Dallas cultivates leaders who collectively address the critical needs of the community. Founded in 1922, the JLD is one of the largest Junior Leagues in the world, as well as the largest and oldest training organization for women in Dallas. Active members range in age from 22 to 49 with more than 85 percent of women employed outside of the home. The JLD provides leadership opportunities to over 5,000 women each year through more than 26,000 cumulative hours of experiential and formal training. Uniquely member-run, the JLD provides over 100,000 hours in volunteer service and $1 million in funding to area nonprofits each year. For more information, please visit www.jld.net or Facebook, Instagram, LinkedIn and Twitter.